3rd PAGCOR Nat'l Photography ~ Philippine Freebies, Promos, Contests and MORE! 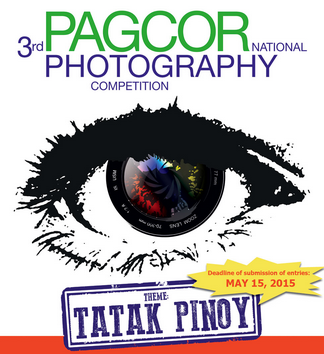 If you missed last year's theme, now is your chance to submit your entries for the 3rd PAGCOR National Photography Competition. With the theme "Tatak Pinoy", the photos must depict Filipino traits and traditions that were passed down through generations, or anything or everything that at one glance can be identified as something very Pinoy. You can enter on any or both of the available categories: Conventional Photography and Mobile Photography. Upload your entry/ies upon completion of the online registration/entry form. There will be four (4) regional screenings (Luzon, Visayas, Mindanao, Metro Manila). From there, five (5) finalists in each category will be selected and move on the the Grand Finals. Twelve (12) very talented winners in the Conventional Photography category and Mobile Photography category will each take home P75,000 and P30,000 respectively plus a trophy. There will also be consolation prizes for non-winners worth P20,000 and P5,000 plus a Certificate of Merit. In addition, a P5,000 cash prize + Certificate of Recognition will be awarded to the Most Popular Photo that garnered most votes online. Theme: "Tatak Pinoy" - Positive things or images that are very Pinoy such as our way of life, traditional Filipino stuff, food, traits, mannerisms, culture and tradition, celebrations, places/destinations, etc. For more info, log on to pagcor.ph or call the Corporate Communications and Services Department at 525-2257 or 526-0337 loc 2505 to 2508.